You’ve got the perfect composition, great light, and an amazing subject. You push the shutter and the image looks pretty good on your mini LCD screen. 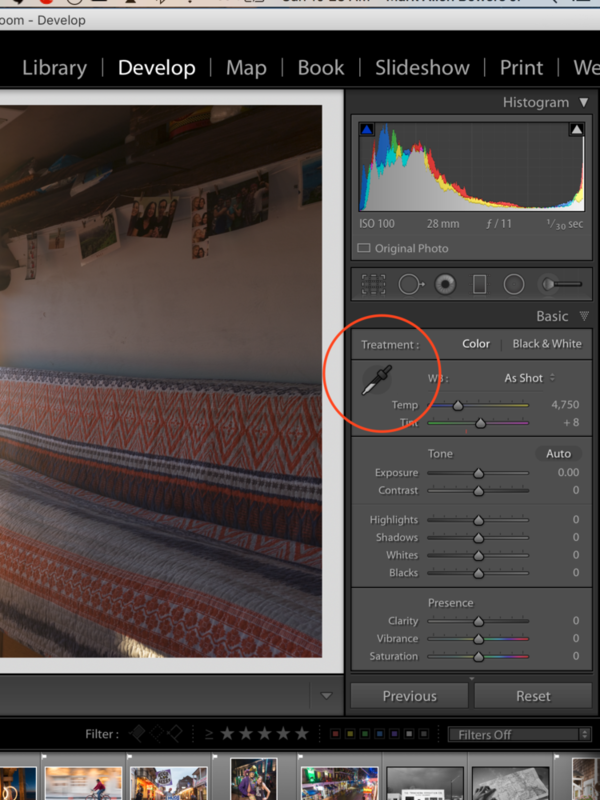 You import the shot and quickly realize it suffers from a common issue: color cast. Preventing, and removing a color cast is something every photographer will encounter and must subsequently manage throughout their career. 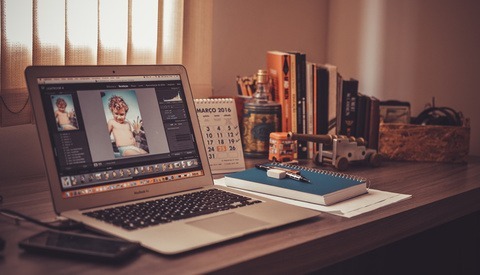 The following article provides tips for doing so and by implementing these steps into your workflow the issue will become much less of a burden. 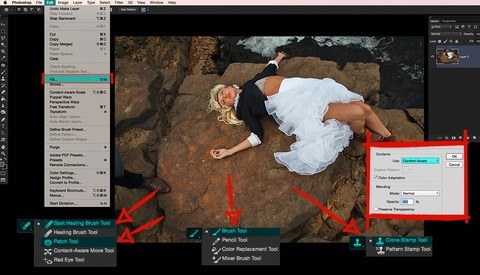 First, you need to do all you can in camera to prepare for managing a color cast in post. This includes shooting in raw which provides leverage when adjusting white balance later on. White balance settings are directly tied to the overall color in an image therefore, slight adjustments can create large differences. It is also important to avoid objects in your photo with strong, unwanted colors as much as possible as those colors will almost certainly be reflected onto your subject. This especially includes anything that is red or even the color of your shirt as the photographer. Finally, before or after shooting a scene take a shot of something that is pure white or 18% gray, such as a gray card, as close to your subject as possible. These surfaces can provide a benchmark in post to properly measure the color temperature in a scene. It should also be noted that all of this will all be in vain if your monitor is not properly color calibrated. This is commonly overlooked by amateur photographers but incredibly important as the colors on your monitor are almost certainly not accurate. B&H sells color calibration tools as part of its Daily Deal Zone offers all the time. I was able to pick up the DataColor Spyder5Pro for less than a $100 and it has more than paid for itself over time. This is by far the easiest and most obvious way to remove most any color cast. 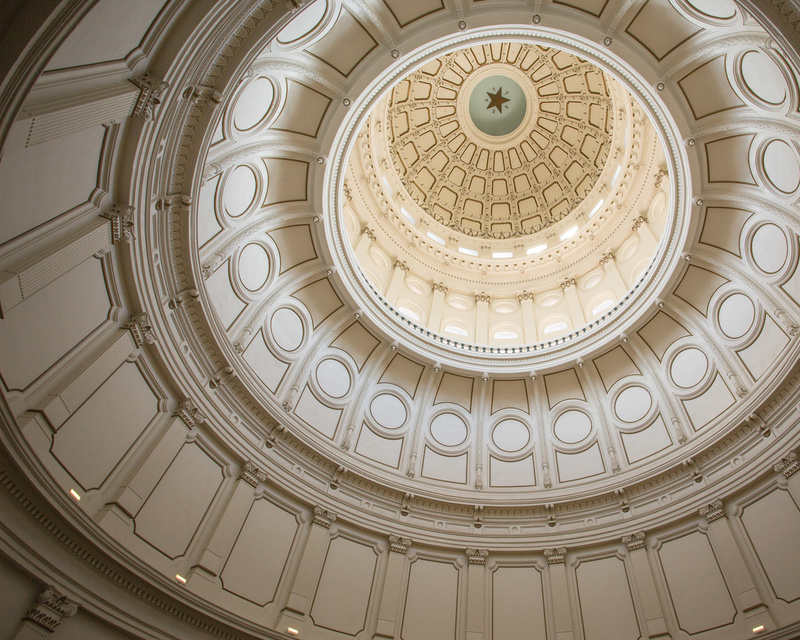 The eyedropper tool can be found in both Lightroom as well as Camera Raw in Photoshop. Assuming you took a shot of something pure white or 18% gray, all you need to do is select the tool and click on the respective surface. The software will automatically adjust your color balance in the image and ideally, remove any unwanted cast. Even if you didn’t shoot something pure white in your image, try and identify a surface that should be close to pure white and use that as your correction point. For example, this shot of the Texas Capitol came out incredibly warm and needed to be cooled down. Some of the walls appeared fairly close to white so I clicked on one of the brighter surfaces resulting in a significant improvement. 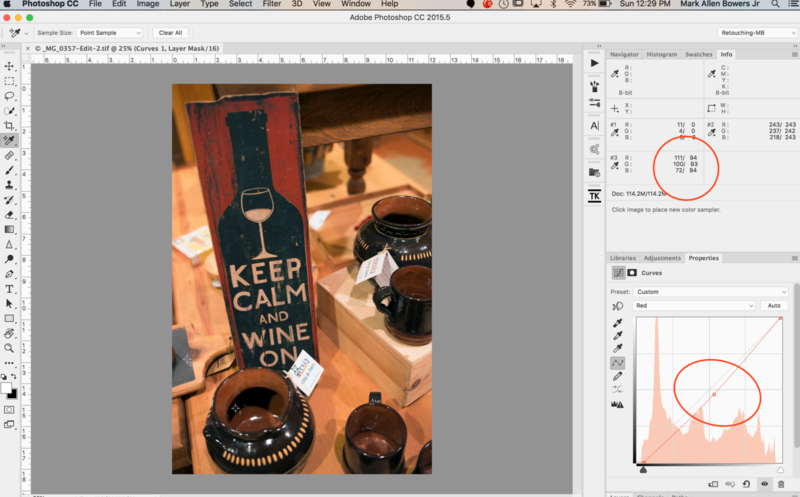 Using the same image as above for comparison’s sake, we can do the same with a simple curves adjustment layer. 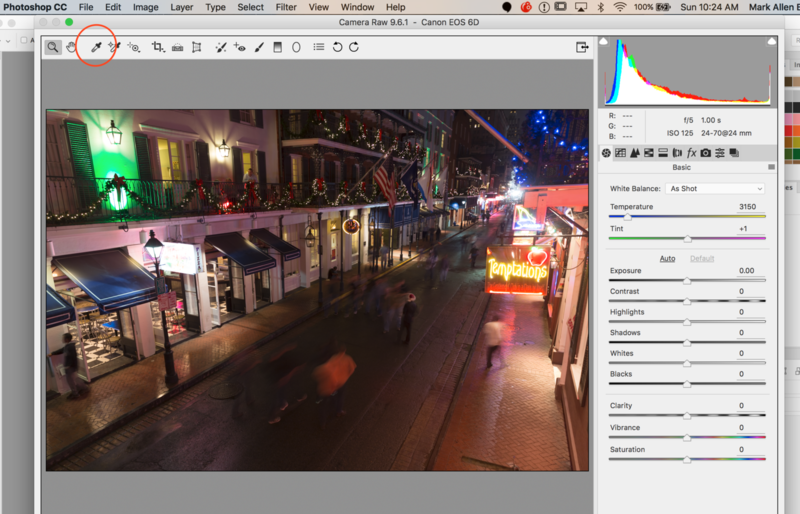 Simply open your image in Photoshop and adjust your raw settings as needed. 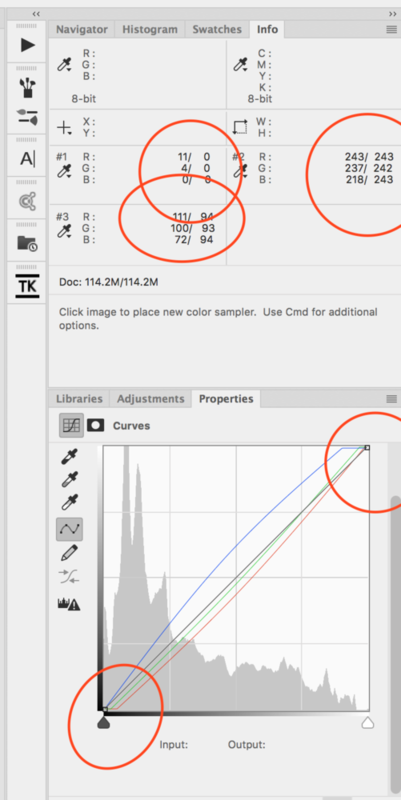 Add a curves adjustment layer and under the RGB dropdown, select one of the color channels. With the Option key held, click the black point slider and drag to the right until you see clipping. Do the same with the white point slider and for each consecutive color channel. After each channel has been adjusted you should see a similar improvement. Another method yet is to add the color cast’s opposite. 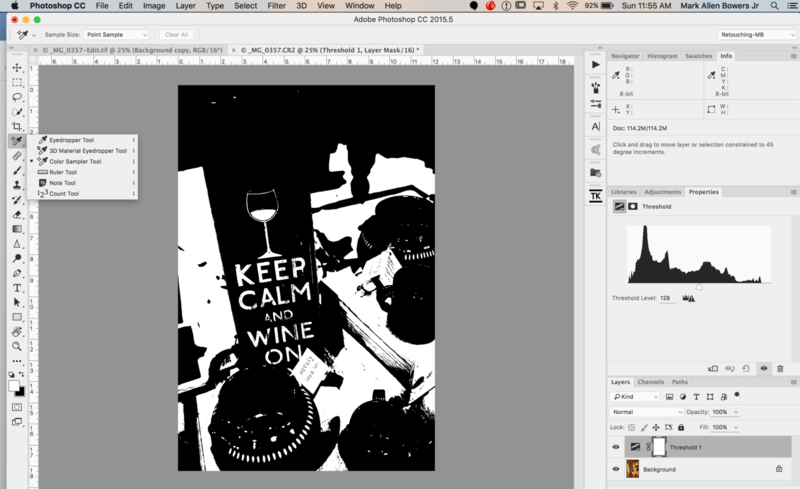 To do this, open your image in Photoshop and duplicate the background layer. Go to Filter, Blur, and choose Average. The layer will become a solid color at this point representing the average representation of all colors in your scene. 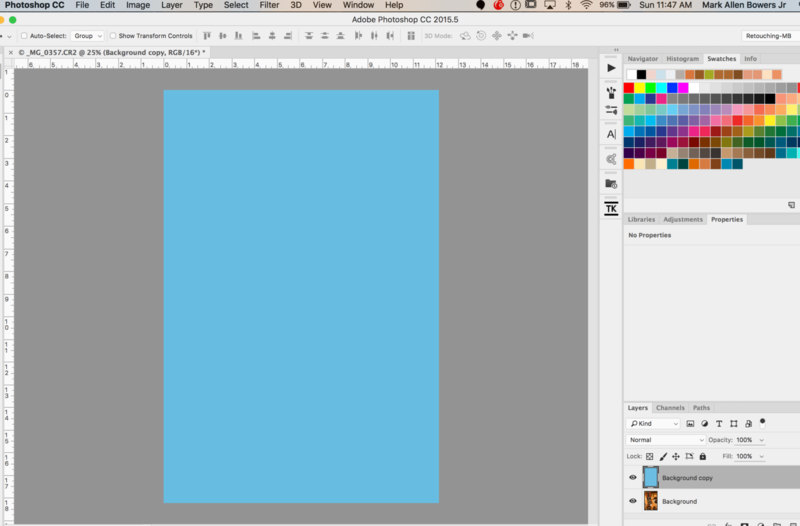 Invert this layer next by hitting Command/Control + I. This will flip the solid color to its exact opposite. Change the layer blend mode to Color and adjust the opacity down until the overall tone in your scene appears neutralized. This shot taken inside of a winery lobby came out incredibly warm and yellowish due to the color of the lights and oak barrels surrounding our subject. Blending in the opposite color from the scene created a far more pleasing look. When all else fails, this method is a sure fire way of correcting virtually any color cast although a bit more time consuming. 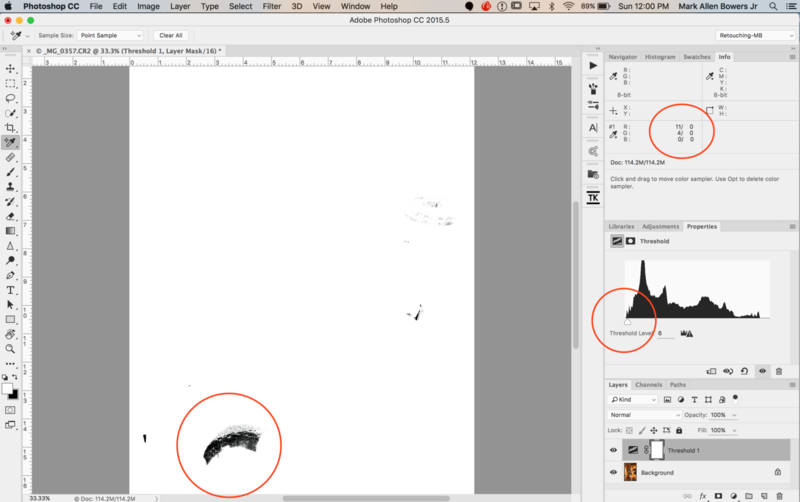 The method requires you to identify 3 points in an image that are neutral in tone by using the Info panel in Photoshop. 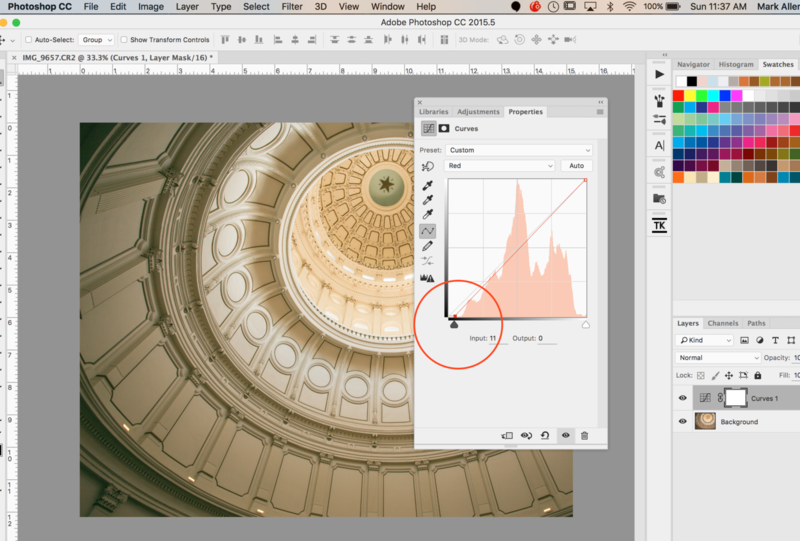 Open your image in Photoshop and create a threshold adjustment layer. Adjust the midpoint slider to the far left until the image appears pure white. Next, slowly slide the midpoint to the right at which point black will start to appear in certain parts of the image. Using the color sampler tool, hover over the various black spots and identify a point with a value of no less than 8 for any channel in your Info panel. Click the sampler tool to create a marker on this spot. If you cannot obtain higher than 8 in all three channels, at least find a point higher than 8 in two channels. The Threshold adjustment layer creates a black and white look that is helpful for measuring and 100% black and white in an image. We can then sample these points for reference using the Color Sampler tool. Next, do the same but to the far right with the mid-point slider. The key now to find a spot of white with a value no higher than 248 in any channel on your info panel. Again, mark the spot with the color sampler tool. Delete the threshold layer. Now try and find a spot in your image that is as close to gray as possible. This is subjective so do the best you can, it can be adjusted further later. Lastly, open a curves adjustment layer. The objective is to bring the colors numbers in the info panel to neutral. For example, sample point one is our black point with a lowest value of zero in the blue channel. The blue channel contains this value so the only adjustment is to the red and green channels. In the case of the white point sample two, our highest value was 243 in the red channel. So we need to adjust the green and blue channels to match this number. Finally, the gray point. Take the 3 numbers from your gray point selection and average them. In our case, 111, 100, and 72 average to 93. Open each channel individually and instead of adjusting the extreme points, click the middle of the curve and move it up or down until the final value for each color channel value is 93. 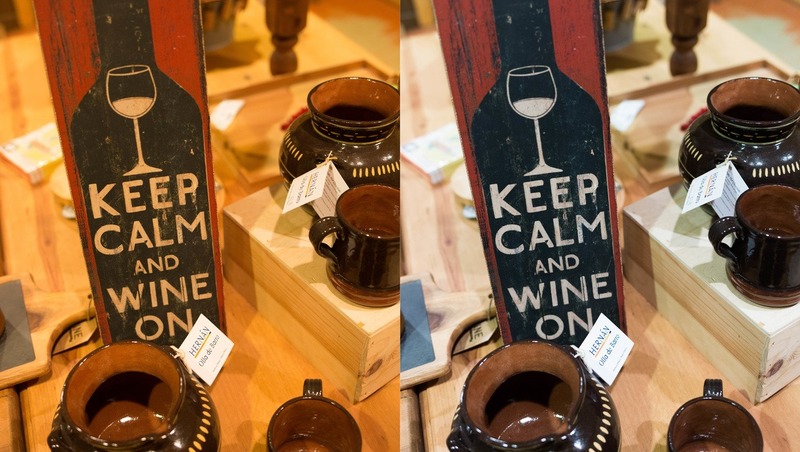 This was he resulting correction in the scene from the winery. As you make adjustments, it may affect prior adjustments so be sure and double check once all are complete. At this point you should have a color corrected image that is far improved from its original. 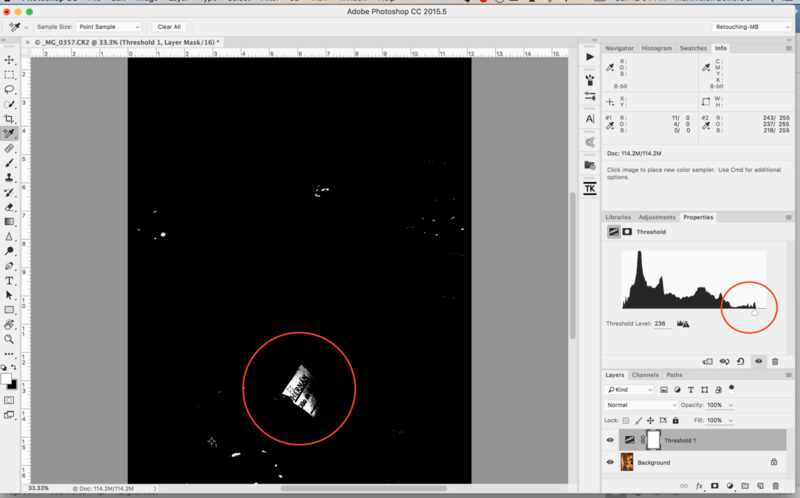 These methods can be used interchangeably and results will vary for each image. Practice with each and see what works best for you. As always, feedback and examples of your own work are highly appreciated. Very useful article. Thanks for posting. I would also recommend learning the color temperature of light. You can then pick the predominate color in the scene and set your color temperature manually. I also use Nik's (now Google's) "remove color cast" filter. It is quick and does a pretty good job. Hey Michael, great point. I have used that filter several times and it is very intuitive. And free now! 1. Buy a grey card- the credit card sized ones in hard plastic ($5 bucks on Amazon with Prime ship). Since the card is the exact size and thickness of a credit card... place one in your wallet amongst your other cards. You'll always have it wherever you go (which will also come in handy for you folks who shoot in raw on your phones). That little trick of putting one in your wallet is an absolute lifesaver. 2. In photoshop, there's an easier way to color correct (though i do all of mine in Lightroom so i can apply it to all the photos in one shot). 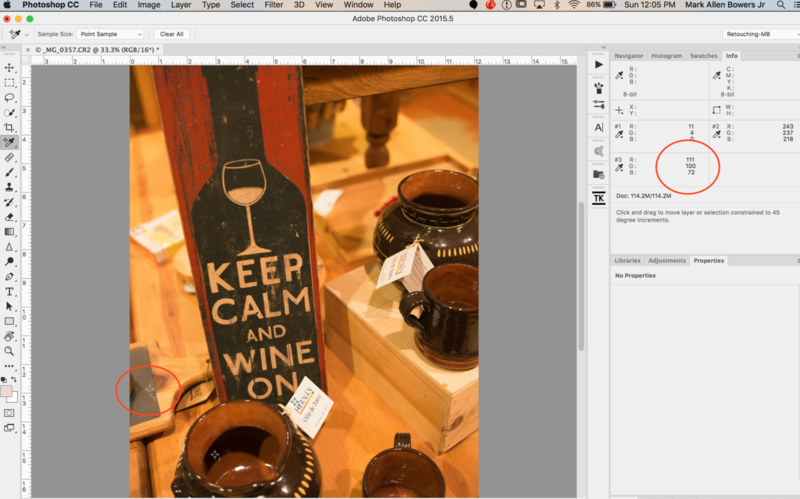 Open a photo, insert a default curves layer. Go to each channel (i.e. R, then G, then B) and move the light and dark sliders up to the base of where each light/dark peak starts. Very quick, very easy, and no fuss. That method has been around for a good 5 or 6 years, as well as the article's section on doing it by the numbers. I've been retouching in PS for a long time so i'm spoiled. Great article though for folks who have never thought or knew how to color correct. (God bless raw files though). I also use PS actions that create a red and orange desat layer for pulling overly warm tones out of skin while leaving everything else intact, which is also a lifesaver, especially if you shoot people in event halls or clubs. Jay-would it be possible to send me the action you created? I'd love to try it out - markbowers84@gmail.com. 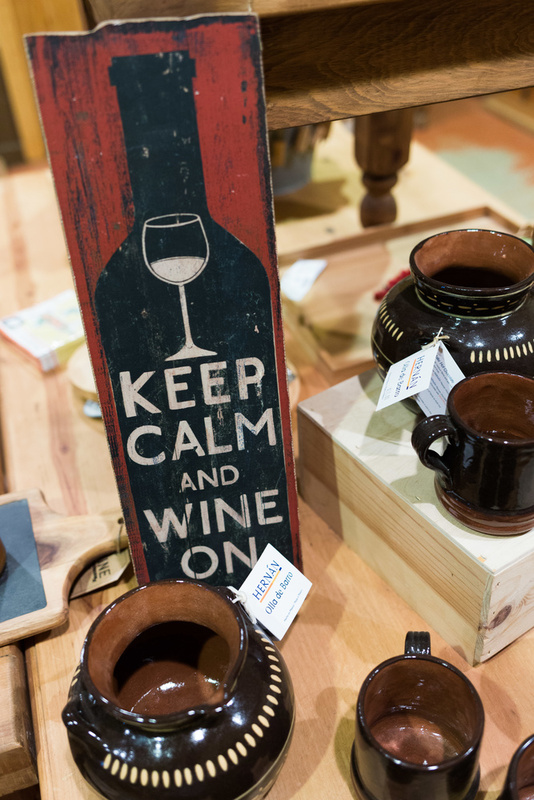 If not, perhaps list the steps to create my own? Many thanks! While the bulk of my color correction is done in Lightroom, I use the desat actions as finisher actions to clean up any specific tones created while working in Photoshop. Thank you for not just sending "the action". Sad when the article writer wants to take the easy way out instead of learning the software. Sadly there's no action to make one a professional photographer Mark. Great article! Thanks for sharing this input. You are very welcome Lukas! I hope it helps, pls share if you find it useful! Another simple option in Photoshop is to add a curves or levels adjustment layer, pick the white point selector, pick a white area near full 255 with the cast, and then change the adjustment layer mode from NORMAL to COLOR. In your image example, I would click on the white tag in the upper right. 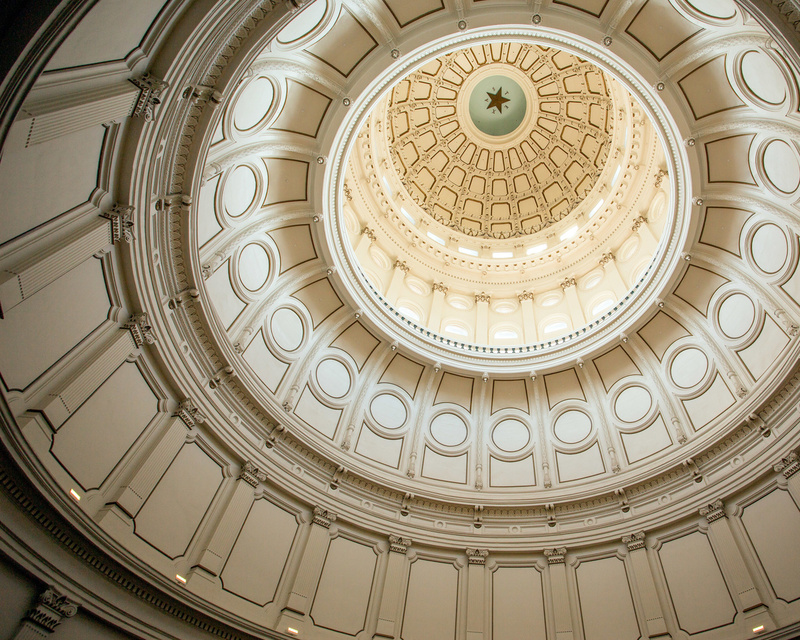 This doesn't always work, sometimes you may wind up with color banding, but it tends to work more often than not. The trick is to pick a color cast area near full white. If it should overshoot in the correction (assuming no banding), you can always dial back the fill or opacity slider to get a good balance. Sometimes you need to sample deeper into the color cast if the near white areas aren't moving the color enough. Again if you overshoot, dial back the layer. Here's what I got by sampling the area indicated by the cyan arrow. In this case instead of dialing back overshoot, I simply partially painted away areas I felt were over-corrected. I felt the box label and earthware in your sample seemed over-neutralized, I may be wrong but I think I got a more natural balance on these items, have a look. If anything I should have also thrown in a Hue/Sat adjustment layer, again set from NORMAL to COLOR, and knocked the sat back a bit. I also switched over to AdobeRGB before going back to sRGB to have a little more playing room. You do realize that Photoshop has a built-in control to neutralize color casts, right? 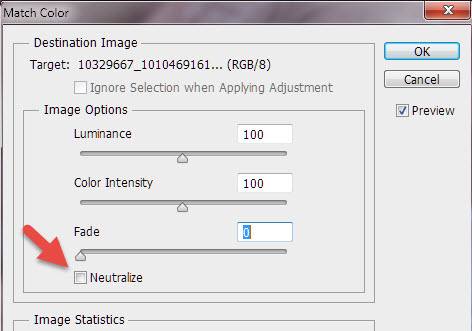 Go to Image -> Adjustments -> Match Color, and when the control comes up, check the 'Neutralize' box. Results may vary, but it's often a good place to start from. You can alter the color intensity, luminance, and fade the effect from the same control. Great info here, thanks! 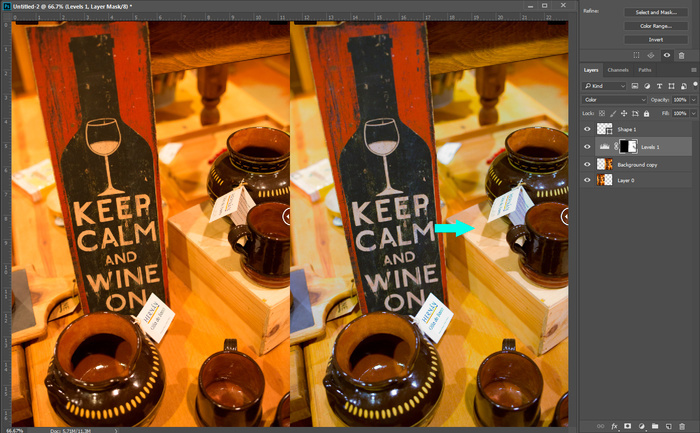 I wanted to say that if you are trying to adjust the white balance on a photo in Lightroom using the eyedropper it must not be on something that's 100% white.